Freezing feet are uncomfortable in winter. Without warm winter socks, even the best winter clothes don't help much. There's also a high risk of getting a cold. High-quality thermal socks make winter more comfortable, both in winter sports and in everyday settings. Wool socks or synthetic fiber socks? Grandma's time-honored wool socks may provide warmth for your feet. But they don't have much in common with high-quality Merino wool socks from Woolpower or Mons Royale. Unlike synthetic fiber, Merino wool stays warm when it's wet. They're odor-neutral through and through. You can wear them for several days in a row without any problems. Winter athletes value the high breathability and quick drying time of synthetic fiber socks. Both materials are comfortable to wear. Mixed fabrics made of Merino wool and synthetic fibers combine the helpful properties of both materials. These come in handy as well. Everyday socks or sports socks? Various winter socks are available depending on the use. Ankle-high socks are good enough for everyday use. Their padding doesn't have to be particularly strong. The fit can be comfortable, by all means. And for winter hiking or snowshoe tours, the socks can have a somewhat higher cut. Reinforcements and padding on the ball and heel improve comfort. 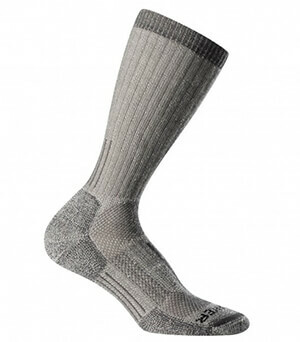 Odor-neutralizing Merino wool socks deserve a warm recommendation. They're helpful for longer tours, strenuous mountaineering, and ice climbing. Winter athletes use high socks with a tailored fit for ski tours, alpine skiing, and snowboarding. To prevent uncomfortable pressure points, they should always be worn higher than the ski or snowboard boot. All areas of the foot should be optimally padded, including the ball and the heel. At the same time, the sock shouldn't be prone to slipping at any of these areas. Socks that fold up in your ski boots are uncomfortable and cause pain. Good winter socks don't slip or press on the skin too much.